The Black Pearl was the original bus that started everything. The Black Pearl was a school bus that served in the fleet of a school district the owner attended. On a whim and partially out of boredom, the owners purchased her when the district auctioned off buses during privatization. The Pearl came home and stayed yellow for quite awhile, while she escorted friends out for good times on weekends. Often people patronizing local establishments would ask for a ride and it soon became clear that such a service was badly in need in the Fenwick Island area. Soon we began to offer free rides home for anyone who needed it with a tip jar on the dash for anything you cared to contribute. No fee was ever required and rides became more an more frequent as people discovered us. 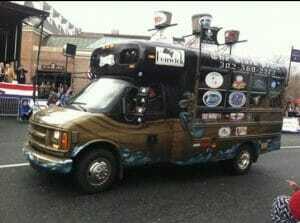 It wasn’t long before the state of Delaware also became aware of us and after a long public struggle, we were told we could no longer operate free and thus the Black Pearl Pirate Party Bus was born! 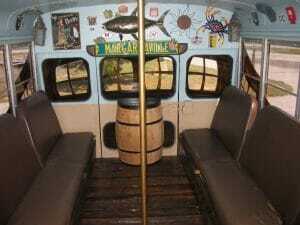 The Black Pearl’s interior is set in a traditional U shape with its original bus seats. The floor of the Black Pearl actually consists of the old Bethany Beach Boardwalk, that when being replaced was generously donated. The interior walls and ceiling of the Pearl are adorned with stickers and nostalgic items collected by our “pirates” during many of our trips. In the early days, those “pirates” were pretty unruly! The exterior of the Pearl was airbrushed by hand with no prior drawing, and is the complete vision and work of a local artist. 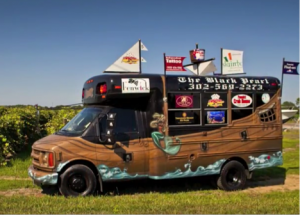 The Black Pearl is the original and probably our favorite bus. Her friendly seating arrangement makes conversation easy. This is the inside view of the Black Pearl, you can see her floors and seating arrangement. This is the front/side view of the Black Pearl. You can see some of her flags and airbrushed art. 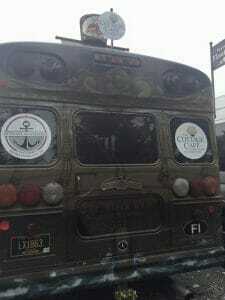 The rear of the Black Pearl- when driving behind her you might catch of glimpse of inside. After the first two years the popularity of the Pearl had grown so much we decided to give her a sister. We knew when we saw Mary, that she was meant for us. Mary’s owner was a southern Maryland resident named John. John had purchased Mary as a project and was slowing fixing her up to be a fun way to do things with his family. Sadly, John never finished Mary because he was killed in a traffic accident by a drunk driver. When we went to see the bus we did not identify our reasons of interest, and when John’s wife told us this story it was clear that this was meant to be. John’s bus would be used to fight and protect against the very thing that took his life. The Bloody Mary is and always will be John’s bus. We are so saddened to have never known him , but his wife and children know that this bus is dedicated to him and their family, and first and the first and foremost reason this business exists- to keep our roads safe. The Bloody Mary has leather seating and a “safety handrail”. Her walls and ceiling are also adorned by things our “pirates” have collected over the years. I hope after reading her story you will understand and share the special meaning the Bloody Mary has to us. 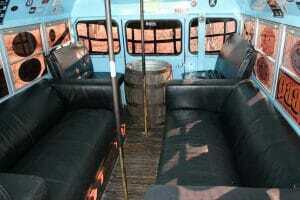 This is the inside view of the Bloody Mary, you can see her floors and seating arrangement. 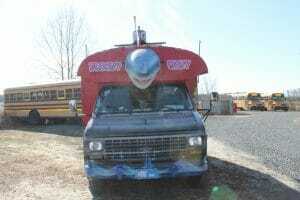 You can see her famous Sharks head- the iconic shark of The Starboard in Dewey Beach, DE. If you look closely you can see her plaque dedicating her to John and his family. The Royal Fortune was added to accommodate guests asking us to provide an upscale solution. This stretch Excursion is classic in outside and inside appeal with no pirate themed exterior, and has traditional limo seating. This stretch Excursion Limousine seats up to 15 and boasts a bar, full entertainment system (CD, iPod, MP3, DVD, 2 TFT screens) and a privacy divider. The Royal Fortune was added late 2018 to provide an upscale solution and boasts traditional leather limo style seating. The Royal Fortune is a cost effective and classy solution for many formal events including weddings and golf outings. My friends and I had a great time on the Party Bus! 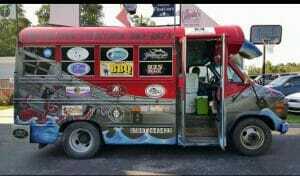 The driver was super nice and ready to take us wherever we wanted to go and got us all home safely. We will definitely use them again. I cannot give enough stars to express how great the Pirate Party Bus was. Working with the team was excellent. I booked the “bloody mary” for a bachelorette party. The team was so flexible and patient during the planning process. They knew where to go for the best bachelorette party experience. Our driver Todd was AWESOME. He was nice, fun, but also super safe with his driving. I can’t imagine any other way to travel in Delaware! Such a fun time all around, such a great team. Being on the bus was half the fun! A much better idea than ubers for a group celebration. Can’t recommend it highly enough. Thanks Pirate Party Bus! 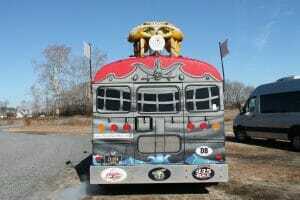 We hired the Black Pearl Private Party Bus for my husband’s 55th birthday. What a night to remember !! Our driver who was the owner, was prompt courteous and had us laughing the whole time. He made our celebration even more enjoyable. Do yourself a favor and use this company, you’ll be so glad you did. What are you waiting for? Lets get you scheduled!